Rogers Sportsnet is set to kick off a new live streaming show on Twitter called Ice Surfing, which is set to debut tomorrow on March 22 from 7-10PM EDT (4-7PM PDT). The show will offer real-time NHL highlights and hockey talk, hosted by Jeff Marek and Jason York. Tomorrow’s show will also feature Winnipeg Jets forward Mark Scheifele and former NHLer Marc Savard, via telephone. It's not about one game, it's about every game. 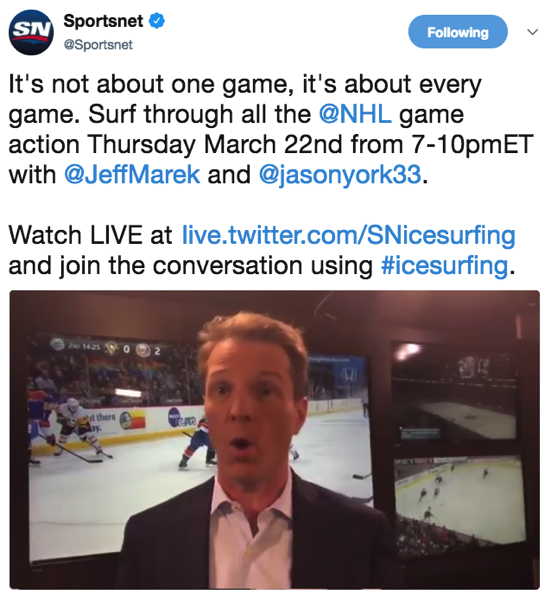 Surf through all the @NHL game action Thursday March 22nd from 7-10pmET with @JeffMarek and @jasonyork33. Tomorrow’s NHL schedule will feature three Canadian teams in action, as the Toronto Maple Leafs, Edmonton Oilers and Vancouver Canucks will see highlights on Ice Surfing. To watch Sportsnet Ice Surfing on Twitter, just visit live.twitter.com/SNicesurfing.